Many of our bright, colorful birds have migrated to more temperate climes for the winter. The western meadowlark (Sturnella neglecta) does not desert us on the sagebrush steppe of Northeastern California during cold weather. 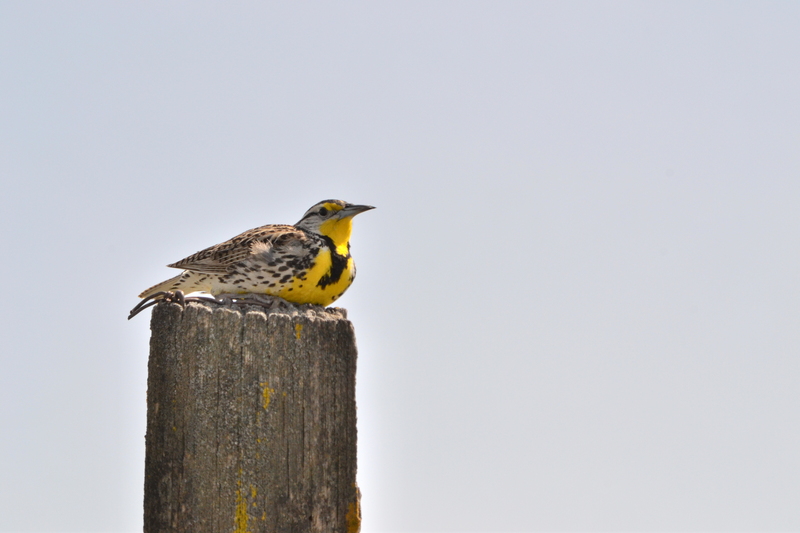 Although its melodious song is not often heard at this time of the year, the western meadowlark does add a bright flash of yellow to the dull winter landscape. There seem to be more western meadowlarks in our pastures this season – an opinion not a scientific observation. Leonard and I are seeing many large groups of meadowlarks sitting along the fence rows or foraging for seeds and grains in the tall nearby vegetation. Usually I do not think of western meadowlarks as strongly social birds, however, they are congregating this winter. Western meadowlarks are a prey of marsh hawks (currently called northern harriers – Circus cyaneus). Although marsh hawks do not subsist solely on western meadowlarks, it is probably not a coincidence that with the increase in meadowlarks around our house the marsh hawk activity seems to also have increased. The western meadowlark is the state bird of six states – Kansas, Montana, North Dakota, Nebraska, Oregon and Wyoming. Apparently Leonard and I are not the only ones to appreciate western meadowlarks. My previous western meadowlark posts include: Western Meadowlark, Meadowlark Hatchlings. This western meadowlark was enjoying the morning sun on a fencepost near our house (Modoc County CA) and was a very cooperative model. This entry was posted in Birds and tagged Circus cyanus, marsh hawk, nature photography, northern harrier, Sturnella neglecta, western meadowlark. Bookmark the permalink. What a beautiful bird. It’s definitely nice that you can get an occasional flash of color during the gray days of winter. I usually have to rely on Northern Cardinals for winter color where I live in Northern Virginia. As a resident of Western Pennsylvania until heading West for graduate school, I sure wish we had northern cardinals in NE California. I miss them – and fireflies!